In the last entry we covered some information about implant grade surgical stainless steel and implant grade titanium. But those aren’t the only metals you can use for an initial piercing; in this installment, I’m going to cover some of the basic details when it comes to what you want to look for in gold, glass, and niobium. Please, as always, keep in mind that this is only a small portion of the information out there, there’s always more to learn. 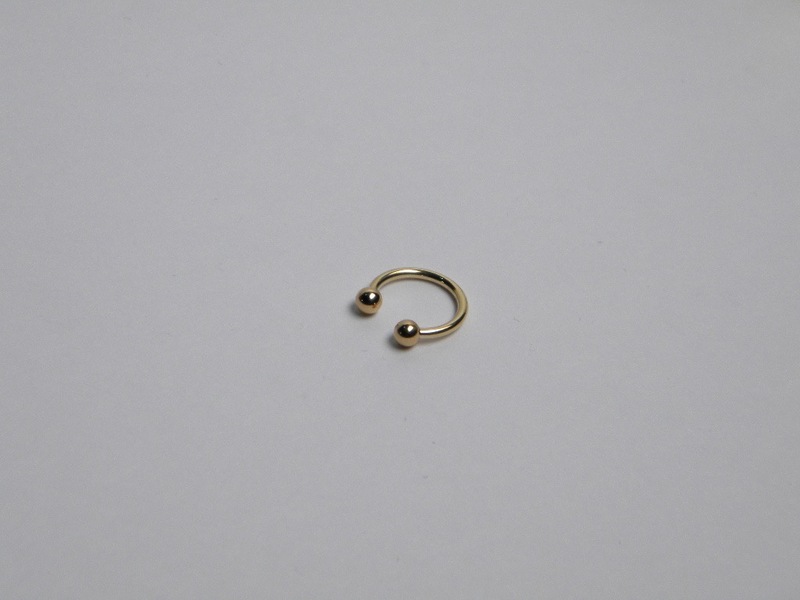 Solid 18k gold circular barbell from Anatometal. 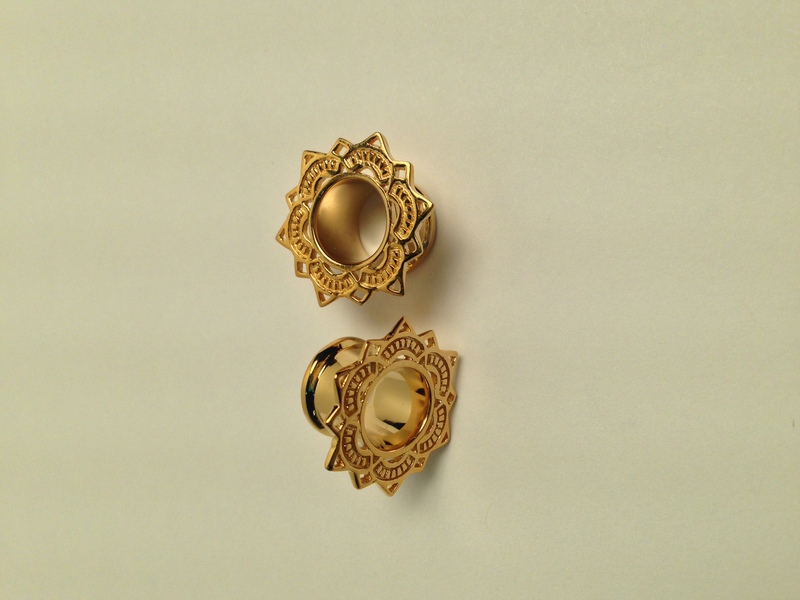 Gold is a beautiful metal, however it is very soft and difficult to work with when you’re making something as precise as body jewelry, which is why you’ll never find any quality body jewelry in pure 24 karat gold; for gold to be suitable for wear, it has to be alloyed with different metals, such as copper, nickel, zinc, or silver. The best options for gold body jewelry are made of solid 14 or 18 karat yellow, rose, or white nickel-free gold and alloyed for biocompatibility. 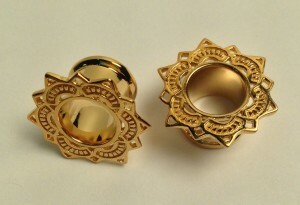 Gold plated "Lotus" eyelets from Tawapa. Solid gold is an important thing to take note of; avoid gold plated, gold-filled, or gold overlay when considering jewelry for an initial piercing because these labels mean that there are other metals beside gold in the jewelry, and you don’t want there to be any question of what is in your body ever. Not to mention the chances of said mystery metals reacting negatively with your body, the plating starting to peel or flake while it’s being worn, or bacteria collecting in microscopic scratches or unevenness on the jewelry. This doesn't mean, however, that gold plated jewelry is entirely "evil" when it comes to piercings, in well healed piercings gold plated jewelry can be worn for short periods so long as it is plated properly by a reputable company. 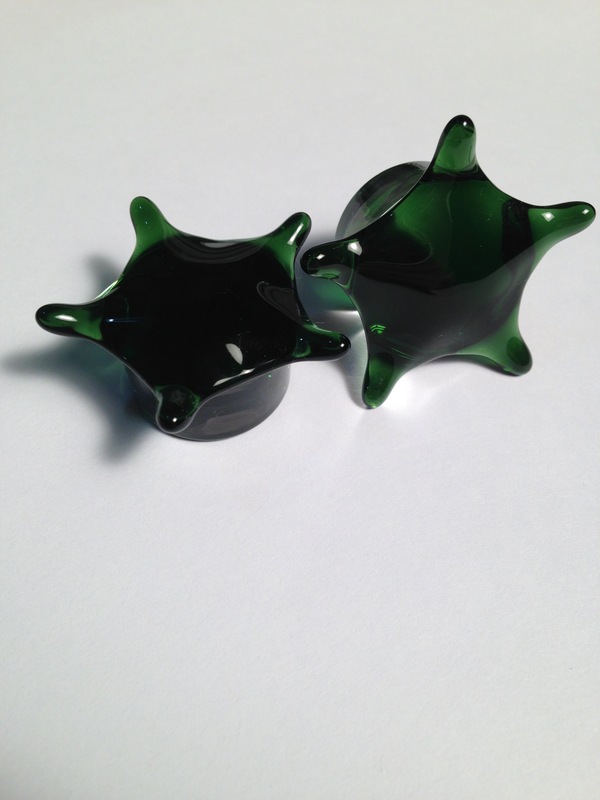 Single flared borosilicate glass plugs from Modifika. 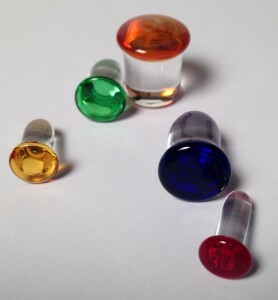 Glass is used in body jewelry for retainers, plugs, and hangers/weights and some piercers even use it for initial piercings, however some stay away from glass because most glass doesn’t have an implant grade standard. In actual practice, most professionals have found that when glass is used under proper circumstances, any healing issues tend to be minimal; some even report faster overall healing in certain cases. But it does come with it’s own risks. Because glass jewelry is, not to be repetitive here, but made of glass, it is fragile, especially in thinner gauge jewelry. If the jewelry gets damaged, it can severely upset even a well healed piercing, so make sure the wearing surface on the jewelry is completely smooth. One healing issue that glass can cause is a condition referred to as “wet ear”: a type of irritation in which there is a sweatiness that occurs around the glass jewelry, sometimes due to being in a humid environment, but it often clears up without any serious repercussions when handled with professional help. 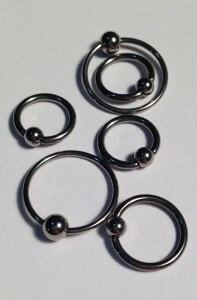 Another issue that occurs for some people is an allergy to the rubber piece (“o-ring”) that is used with most initial piercings done with glass. These pieces are often made of nitrile or silicone, which are supposed to be relatively allergy friendly, but this reaction does sometimes happen; it can be cleared up usually by just changing the type of o-ring being used (black o-rings or clear ones). 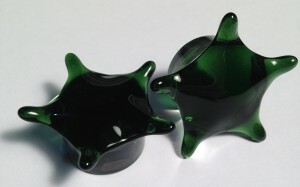 A pair of "Starburst" glass plugs from Industrial Strength. 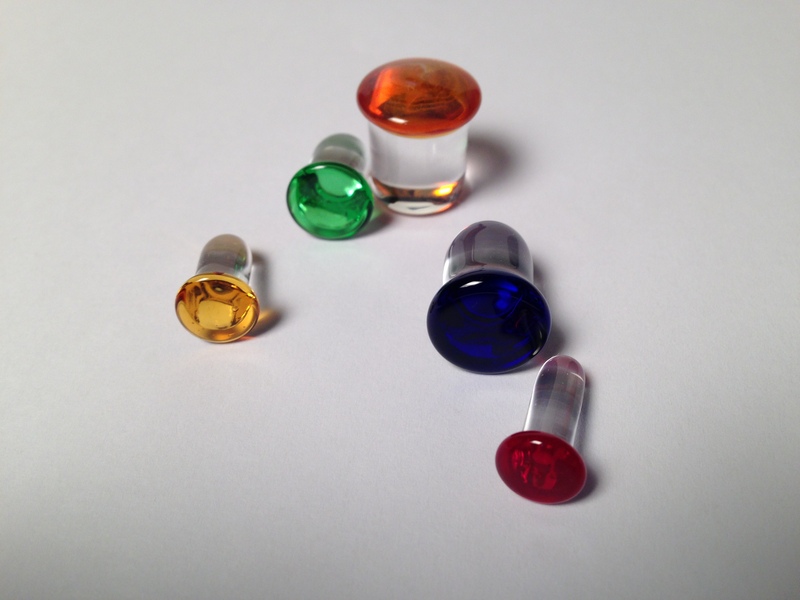 Like any other material used in body jewelry, an important factor in deciding on what types of glass are safe for your piercing is that it is the proper kind of glass. Proper types of glass include: lead-free borosilicate, lead-free soda lime, or fused quartz glass. Almost any reputable piercer will help you make an informed decision in the area. 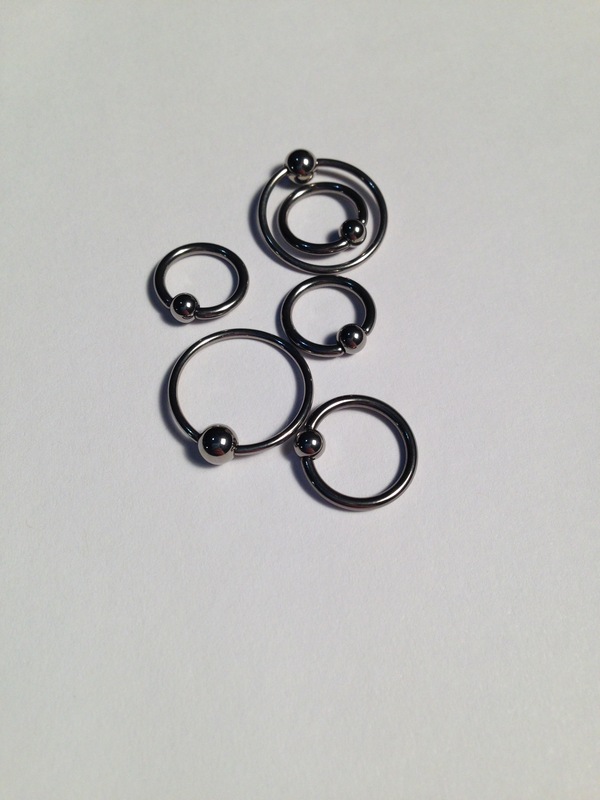 Various sized niobium captive bead rings from SM316. Finally, we have niobium. Niobium is a fairly unique material because unlike most other metals, niobium isn’t alloyed, so it is pure 100% niobium. 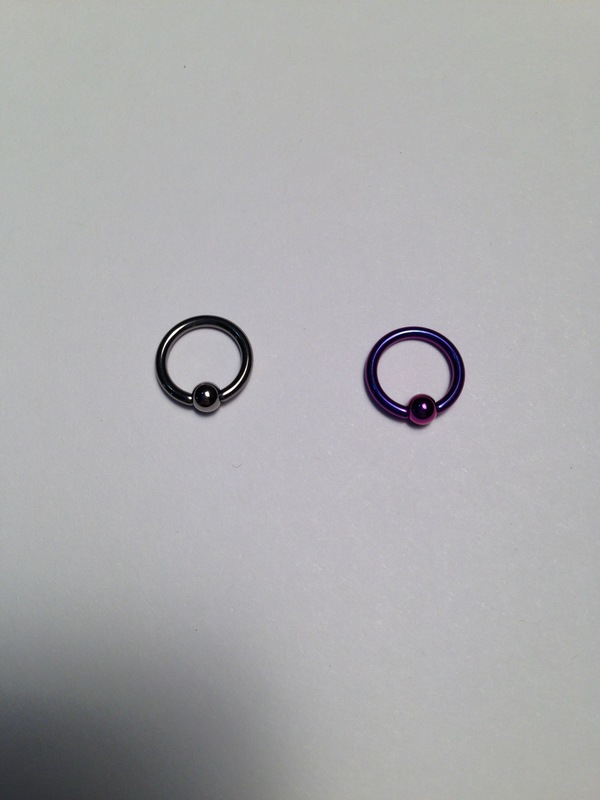 It is hypoallergenic, can be anodized like titanium (niobium can even be heat treated to become black), and safe for initial piercings on top of all of this! But there are downsides to niobium no material is perfect all around. It tends to be heavier than surgical stainless steel, which means that it may not be ideal for larger jewelry pieces, as it will pull too much on the tissue as it heals. It is also difficult to machine, so you won’t find threaded niobium pieces unfortunately, primarily just captive bead or seam rings. And unfortunately there is no implant grade standard for niobium, so it is best to stick with reputable companies when considering using it for an initial piercing. 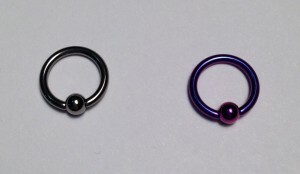 Non-anodized niobium (left) and anodized niobium (right) captive bead rings from SM316. That pretty much covers the basic information for gold, glass, and niobium. All three can be safe for initial piercings as long as they’re safe materials from reputable companies, so always be careful when picking out what you’ll be using in your piercing and you never want to go with the “cheaper” option when it comes to your body.